Learn the basics of lettering (or brush up on your skills) as you create your own chalkboard layout. Chalk lettering is a natural extension of lettering on paper, with a few benefits: you can easily wipe away errors and the larger format allows more room for detail. In this workshop, we’ll go over the basics of lettering, creating a strong layout, incorporating illustrations and filigree and how to transfer your ideas onto the chalkboard. 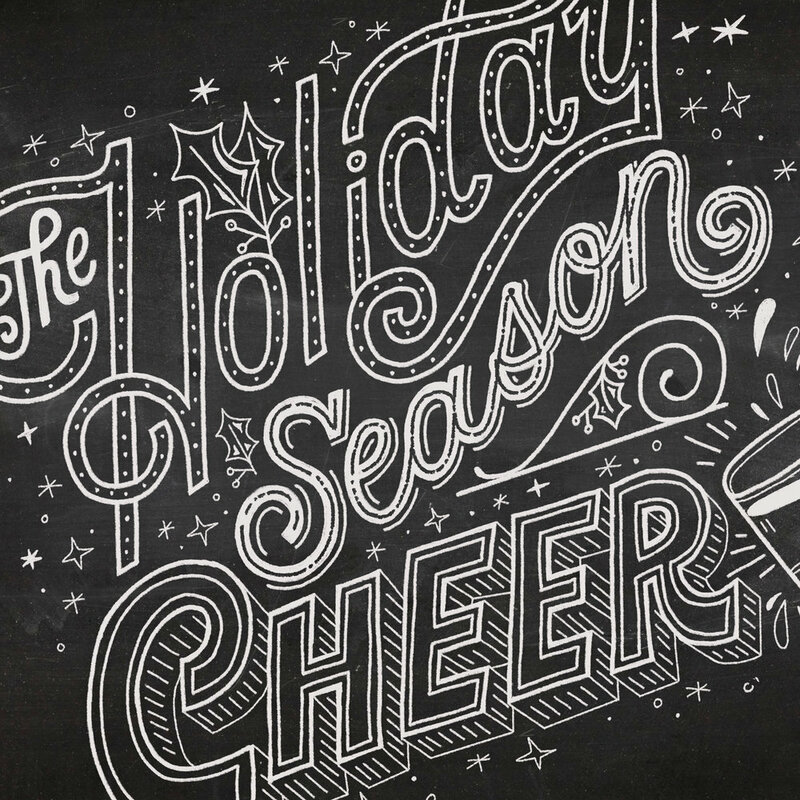 With the holidays right around the corner, we’ll be using seasonal festivities as inspiration for our lettering. I like combining the idea of sweets or cocktails with seasonal themes like; tea’s the reason to be jolly, the holiday season cheers, happily, merrily, joyful, spirited. Or you can simply letter your favorite sweets or cocktails that you enjoy this time of year. Although we’ll have time for brainstorming and sketching during the workshop, you may want to come with a few ideas for what words or themes you’d like to include in your layout. It helps to think about where you may want to display this: will it be on your mantel during a party, a gift for a host? While this workshop is for beginners, a background in drawing or design will be very helpful. Mary Kate McDevitt is a lettering artist in Philadelphia and co-founder of Okay Fine. Mary Kate’s freelance career started with painting on chalkboards with her project, Mini Goals Chalkboards. That personal project led to creating chalk lettering for clients like O Magazine, Penguin Books, and Cooking Light. We'll let you know if a space opens up, or if we add another Chalkboard Lettering Workshop date. In the event you don't make it into this one, what kinds of workshops might you be interested in down the road?